Let these teenage quotes inspire you with your teen. Teenage years can be the most difficult and the most rewarding. 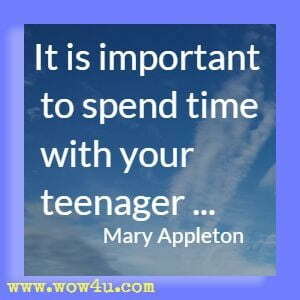 Find wisdom in these quotes to help you with your teenager. When you were a toddler you made me smile. When you were a teenage you made me worry. Can you remember a favourite book, or film, or band, or hobby, a person you admired, or your ambitions as a teenager? They would almost certainly be different to your choices today. The experiences you have had in your life have changed your attitude and will continue to do so. Sue Hadfield, Change One Thing!